Robyn Bell Stanton was born and raised in Louisville, Kentucky. 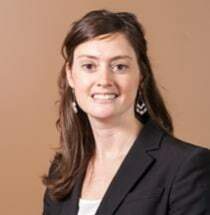 She graduated from the University of Louisville, Louis D. Brandeis School of Law in 2006. During law school, Robyn clerked for an insurance subrogation firm, served as Moot Court Board President, and tutored first year law students in civil procedure. From 2006 to 2008, Robyn handled plaintiff and defense work involving real property disputes with a local real estate litigation firm. From 2008 to 2012, Robyn practiced insurance defense for product manufacturers, premise owners, and trucking companies. Robyn’s defense work also involved mass tort litigation in the MDL, state, and federal court. Robyn joined Morris & Player in November of 2012. Robyn is licensed to practice law in Kentucky, Indiana, U.S. District Court of the Western District of Kentucky, U.S. District Court of the Eastern District of Kentucky, and U.S. District Court of the Southern District of Indiana. She is a member of the Louisville Bar Association, Kentucky Bar Association, and Indiana Bar Association.